This month we bring you a Special 33rd Anniversary Edition Newsletter, which includes all of this! BECO Building Site is Back! "Dearest Brenda, We Are Now At Sea....."
On the 11th November 1983, Neville Hope spoke those immortal words loved by millions of fans around the world. Who'd have thought 33 years on, we'd still be following the Magnificent 7 and enjoying televisions number 1 comedy drama of all time? Over the past 33 years, we've been on a wonderful journey with the boys spanning 40 episodes plus two specials. From Düsseldorf to Marbella to Havana and Bangkok, these boys have been through thick and thin and we still love them dearly. We’ve put together something special! 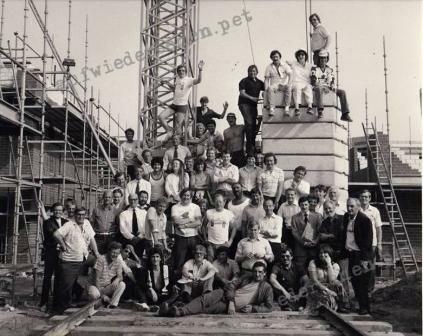 Above, is a never before released picture of the Cast & Crew on the BECO Building Site film set at Elstree Studios, Borehamwood on the day filming wrapped! The eagle-eyed fan might spot Christopher Fairbank on crutches?! That’s right, Christopher managed to brake his leg prior to filming the 13th and final episode of series 1; ‘When the Boat Goes Out’. 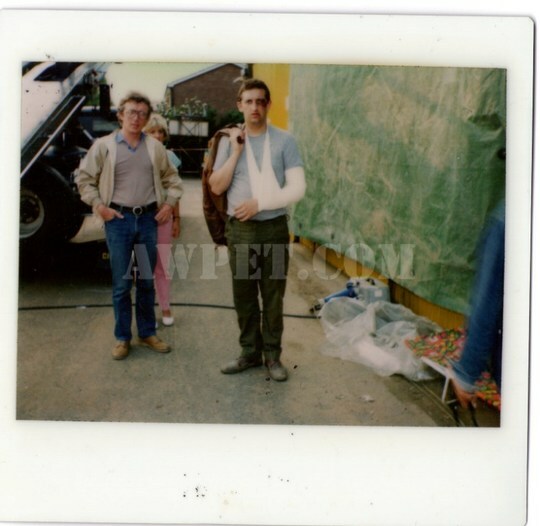 Watch closely, and you’ll notice Christopher manages to hide his injury well; in one scene, an inebriated Moxey is carried home to Hut B by Bomber with his plaster cast ingeniously concealed behind his jacket. We hope you enjoy the Special Edition Newsletter and feel free to share it far and wide. 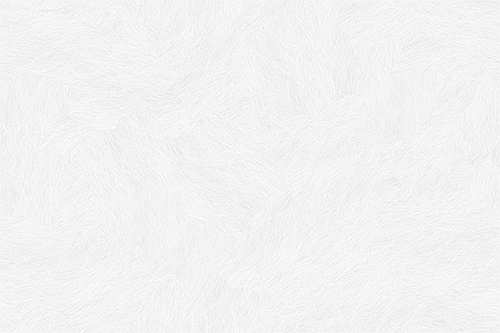 Social media links are at the bottom of this Newsletter. The team have been hard at work behind the scenes to bring newsreaders the first glimpse of the most comprehensive insight into televisions most famous construction site – series 1 BECO Building Site. As some of you may know, the vast majority of Auf Wiedersehen, Pet’s German building site was filmed in the UK at BBC Elstree Studios, Hertfordshire – currently home of the EastEnders outdoor film set. 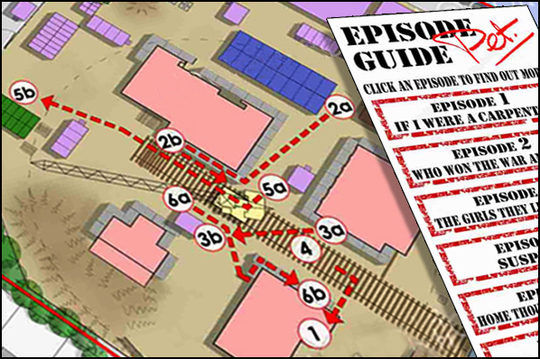 In the first of a number of additional features to be added to the Official Auf Wiedersehen, Pet Fansite, we bring you 13 interactive site plans, allowing you to view in excess of 120 scenes filmed at Elstree Studios. It’s all here.... Where did Wayne first lay eyes on Tracy? Where did Barry and Moxey build their herb garden? Where did Oz fall foul of that red paint chasing vandals? Where did Bomber and Dennis see the biggest rat they’d ever seen? And where did Neville stumble upon that bomb to save the day? In addition, we’ve included a digitally remastered site plan including several artist impressions of the building site to give you an inside view of what the film set would have looked like back in 1982 here. But that’s not all! Over the coming months, we’ll be adding many new features including facts and trivia, three-dimensional aerial views of the BECO Building Site and the ultimate animated film set walk-through plus something EastEnders fans might be interested in! Find out where it was filmed, view interactive episode guides and view artist’s impressions here. Writer Stan Hey with lovable Geordie Oz at the BECO Building Site film set at Elstree Studios, Hertfordshire. We recently spoke to the legendary Auf Wiedersehen, Pet writer Stan Hey and asked him for a few words on his memories way back in 1983 when he was invited to watch unedited footage of a loud, moaning Geordie (no prizes who that might be!) on a German building site prior to penning two classic episodes ‘Home Thoughts from Abroad’ and ‘When the Boat Goes Out’. Find out what he thought of the BECO Building site film set on his first visit plus gain a little insight into his first script meeting which led to the production of two of the finest episodes of series 1. We’d like to thank Stan Hey for taking time out of his busy schedule to give us this fantastic insight into the making of the series. Our brand-new signature series tee-shirt features the very first words of series 1, episode 1 uttered by Geordie Neville Hope encompassing the essence of an adventure to destinations unknow in hope of a better future. This new addition perfectly compliments our range and is digitally screen printed in white to the highest standards on light blue heavy cotton with classic red and white logo to the sleeve. 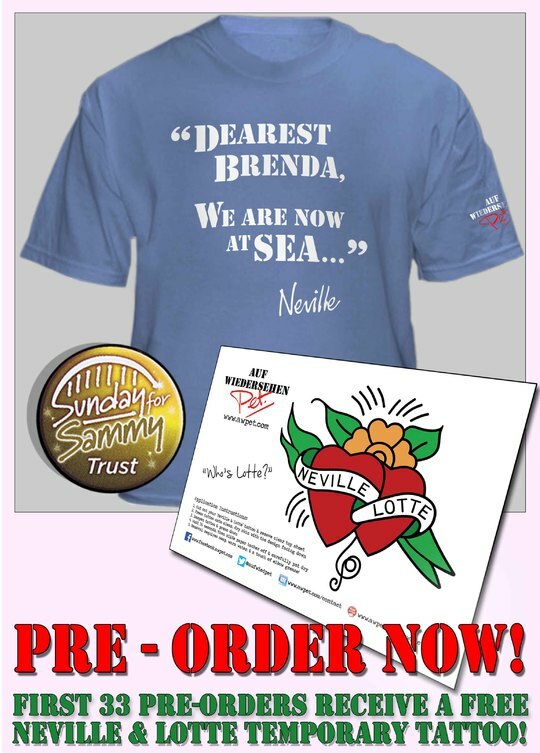 What’s more, to celebrate 33 years of Auf Wiedersehen, Pet we’re offering the first 33 newsletter pre-orders their very own Limited Edition ‘Neville & Lotte’ temporary tattoo as a thanks for your loyal support! Simply pre-order now to be in with your chance. Pre-order now for guaranteed despatch November 2016. This brand-new edition to our range celebrates the opening title track of the very first series of Auf Wiedersehen, Pet and embodies the spirit of “Breakin’ away, until the good times roll around again”. 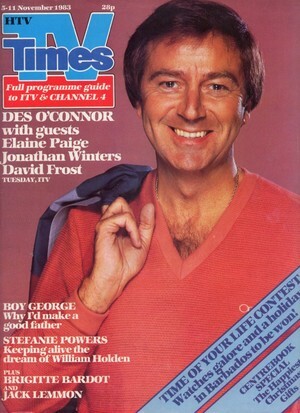 The chorus of the title track is featured in full on the reverse whilst the classic logo is emblazoned in full colour to the front. Each mug comes packaged in its own beautiful presentation gift box complete with matching coaster to accompany your builders brew. With a high gloss finish this mug is both dishwasher and microwave safe. Grab one for yourself or for the Auf Pet fan in your life! From The Archives: "Hard Labour For Geordies In Germany..."
"The ticket inspector aboard the 9.40 London to Harwich express was not happy. Sometime between 9.20 and 9.30 a revolution seemed to have taken place in a first-class carriage....."
So, what you waiting for, grab your DVD’s and join the lads on their epic journey to Germany with Series 1, Episode 1, ‘If I Were a Carpenter’! © The Official Logo Copyright Franc Roddam. 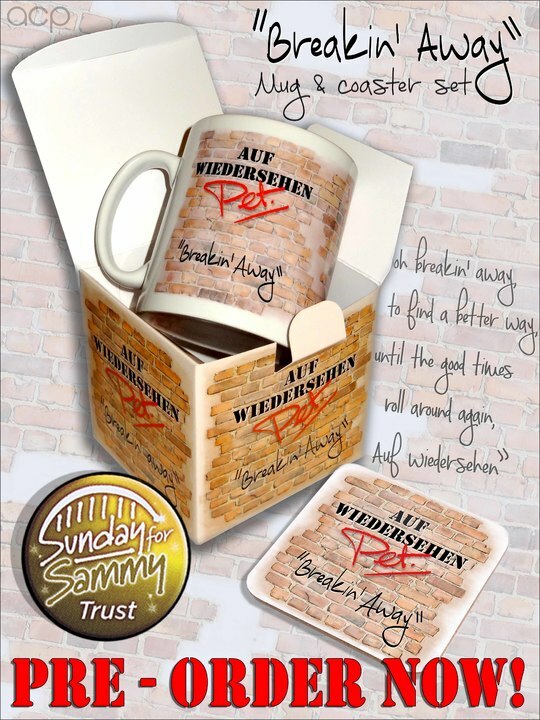 © These exclusive Auf Wiedersehen, Pet designs are copyright of Auf Wiedersehen, Pet 2016.